A feminine room with traditional pieces reinterpreted in modern forms, the bedroom has become a serene space. Florence Broadhurst Cranes wallpaper has been utilised in framed art form, tying the black, silver and pink tones together. 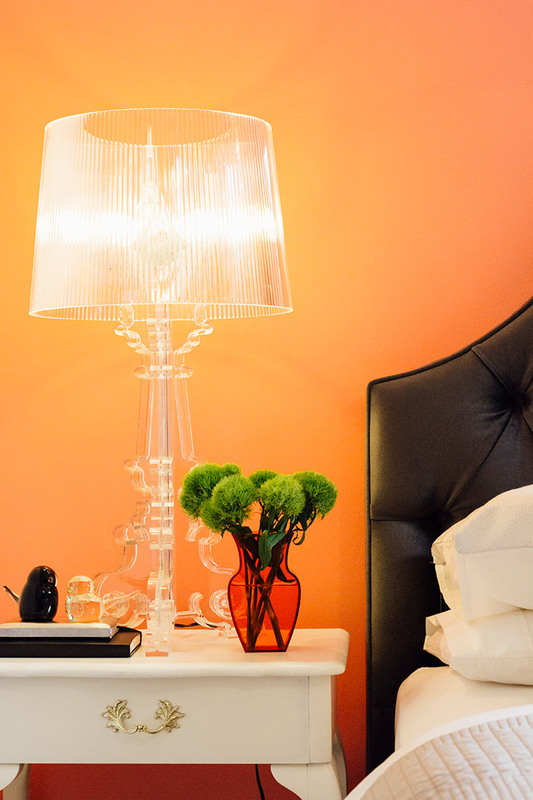 Oversized Kartell Bourgie bedside lamps balance the bed head and add a more modern dimension to the space. 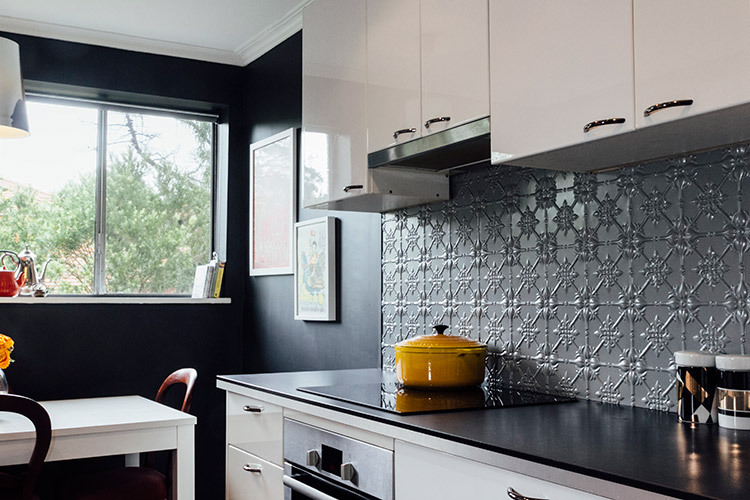 The colour of the new kitchen has always been a dream of the owner, to have an almost black room. 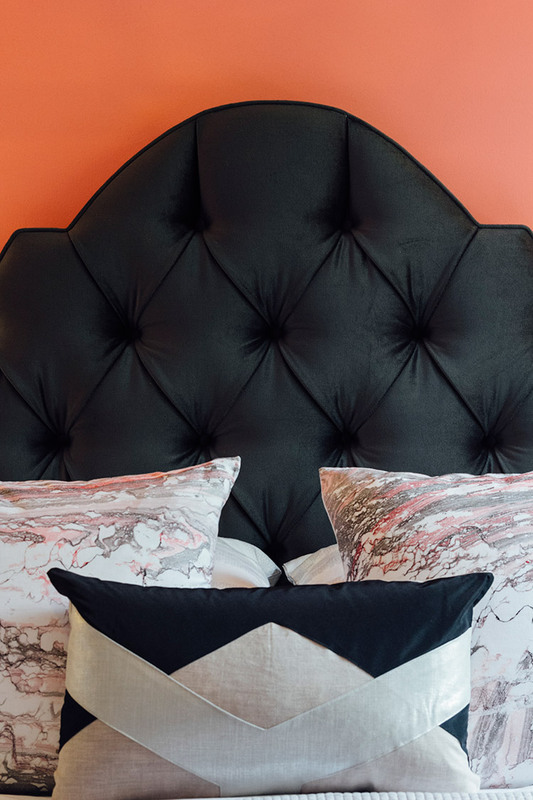 By using white glossy cabinetry and grey pressed metal splashbacks, the room could now accommodate the statement dark paint colour which is a perfect backdrop for the owner’s collection of colourful artworks. Without opening up the space to the living room, this paint colour would have been a challenge. A pale grey paint colour was chosen that contrasted beautifully with the dark kitchen and the white trims, bookshelf and doors. A built in pelmet was designed to allow for wall to wall curtains. 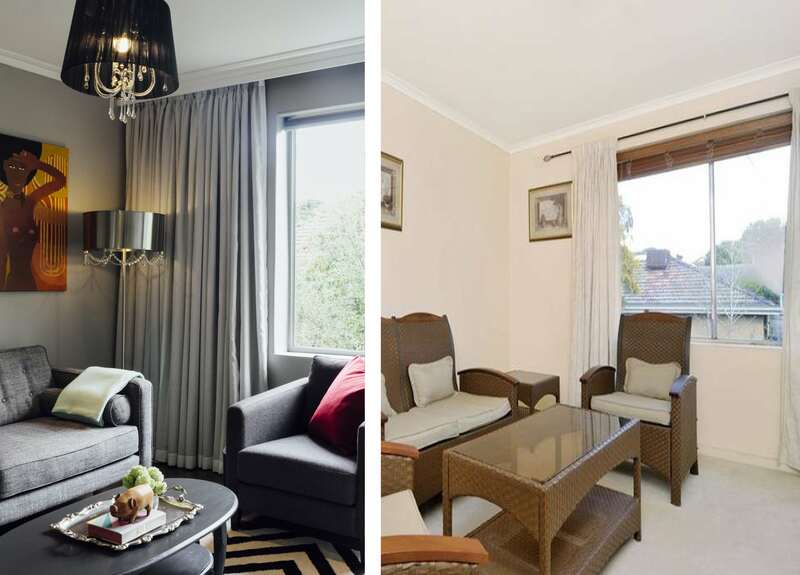 This effect makes the room feel bigger when the curtains are closed and the room is neater visually in what is a small space. The owner has a large book collection, so rather than having a freestanding bookshelf we decided to incorporate the shelving into the design of the living room and the entry hall. The shelving is open at the back allowing for the grey and aqua wall colours to come through adding some visual interest. By doing this, each individual alcove almost become a showpiece its own right to show objet d’art pieces and colourful books. The entry hall has now become a statement in itself, showing the owners true character. 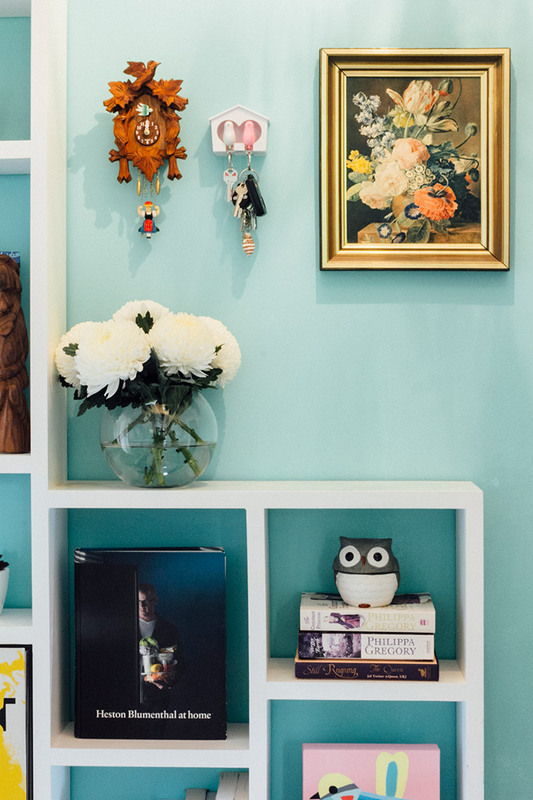 What was once dark and drab is now light, airy and fun with aqua and white paintwork. The inside of the front door was painted the same dark grey as the kitchen to bring unity to the space. 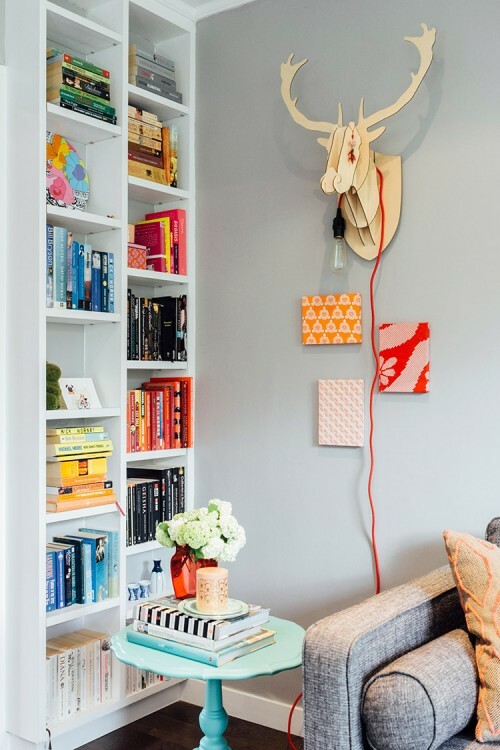 A fixed bookshelf covers one entire wall, utilising this valuable space. 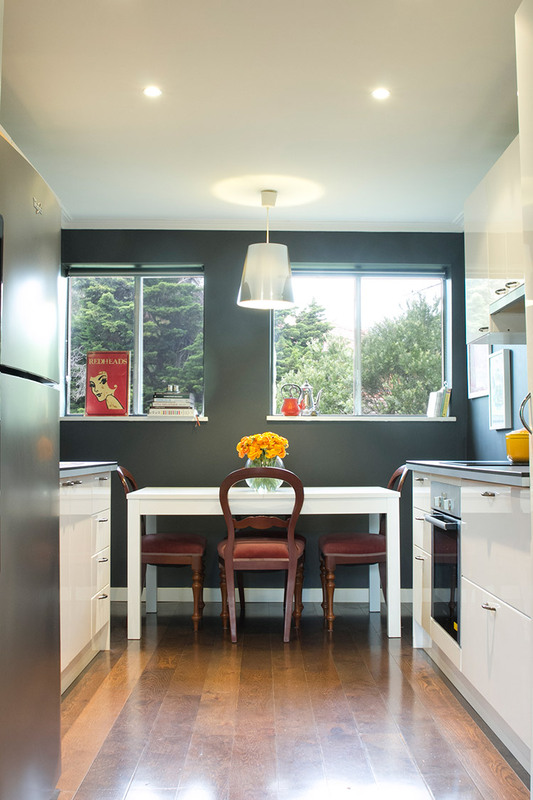 The pendant light in this small space is the playful Tord Boontje Garland in silver. This 1950’s 1st floor flat in leafy Heidelberg was tired and dated. The layout wasted valuable space and in some areas just didn’t make sense at all – A 1.3m wide x 3m long laundry that could only hold a trough and washing machine side by side under the window at the end. The kitchen was poky, awkward and past its use by date! On a positive note, the light was amazing, and every aspect point was of trees and skyline. Working with a builder, I redesigned the space to bring it into the 21st century. We removed the walls between the kitchen, bathroom and laundry resulting in a spacious galley style kitchen and a modern bathroom with a European laundry. The kitchen now has two windows instead of one and an area big enough for a 6 seat dining table. By creating an open plan kitchen and living room we managed to utilise the wasted hallway space by lengthening the new bathroom to extend all the way to living room divide. The final adjustment was moving the 2nd bedroom door to the entry hallway. The wardrobe in the 1st bedroom was just a small cupboard set back into the space. 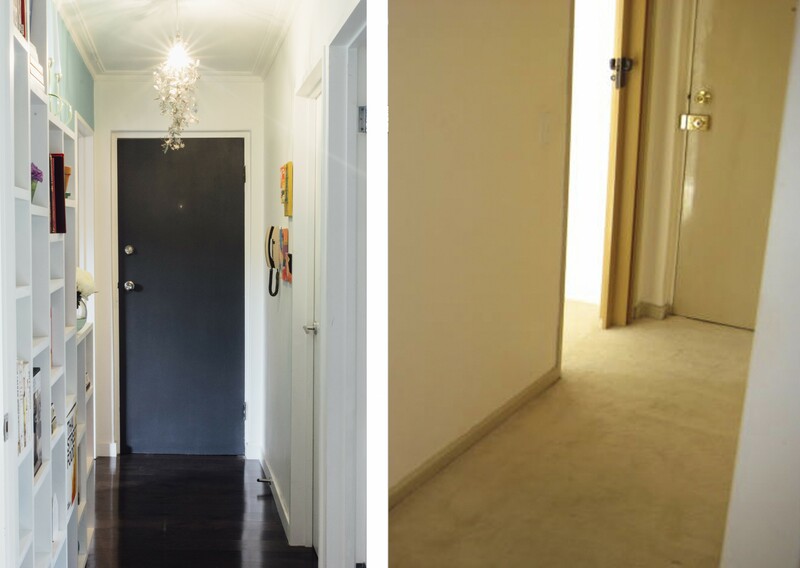 We removed it completely and created a small walk in robe complete with mini chandelier to add some charm.